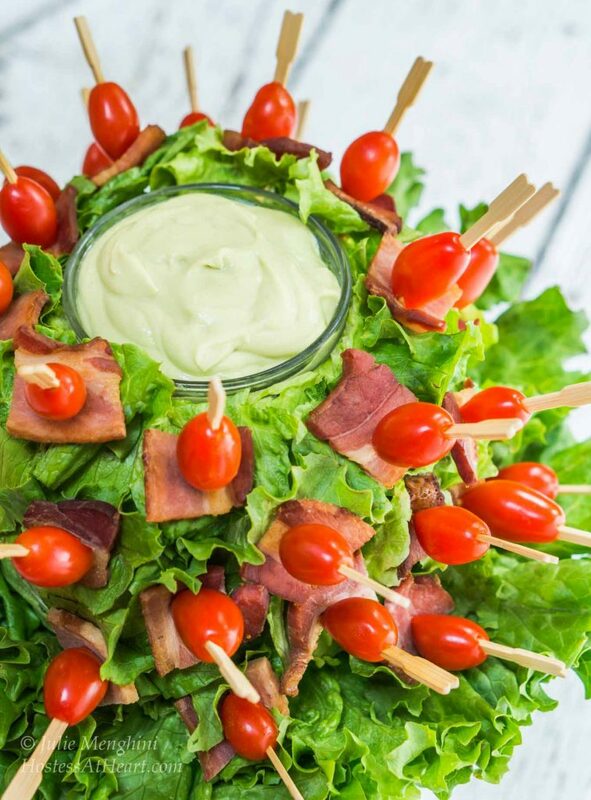 BLT Skewers with Avocado Sauce brings all of the flavors of the sandwich that we love to your fingertips! There are a lot of events this time of year that have me entertaining. I’m always looking for new no-fuss appetizers. I had some bacon leftover from the Bacon, Lettuce Tomato and Avocado sandwiches we had for dinner. I just thought that making a BLT Skewers with Avocado Sauce would be perfect for any entertaining that I was doing. The men in our family love bacon. In all fairness, so do the ladies. So serving this on Father’s Day would be a great idea, and all of the beautiful colors make it perfect all summer long. Talk about fun and delicious! 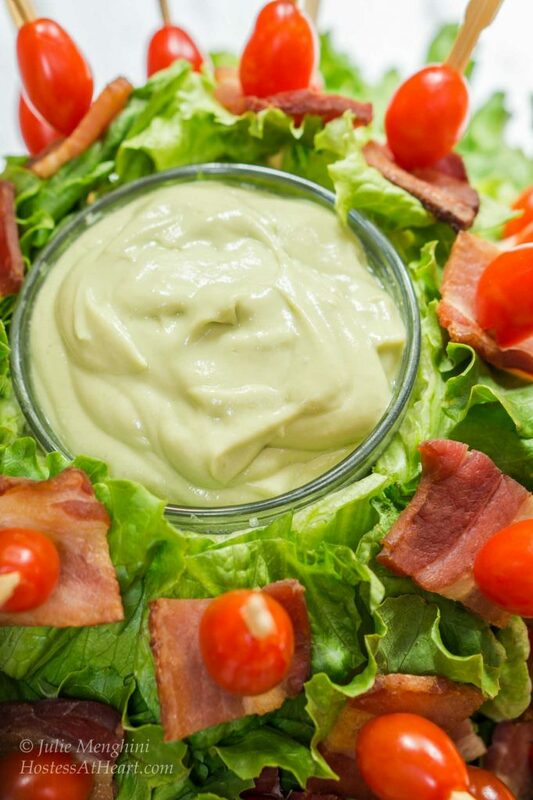 Bacon Lettuce Tomato Skewers with Avocado Sauce is like enjoying a BLTA at your finger tips. Using a sharp knife, carve out the middle of the head of lettuce in the shape of the bowl. Carve deep enough for the bowl to sit even or slightly above the edge of the cut circle. Cut bacon and green leaf lettuce into approximately 1 inch pieces. Feed skewer first with a grape tomato, followed by the bacon and then the lettuce. Push picks into the head of lettuce. Combine all of the sauce ingredients together. Whip in a small food processor until creamy. 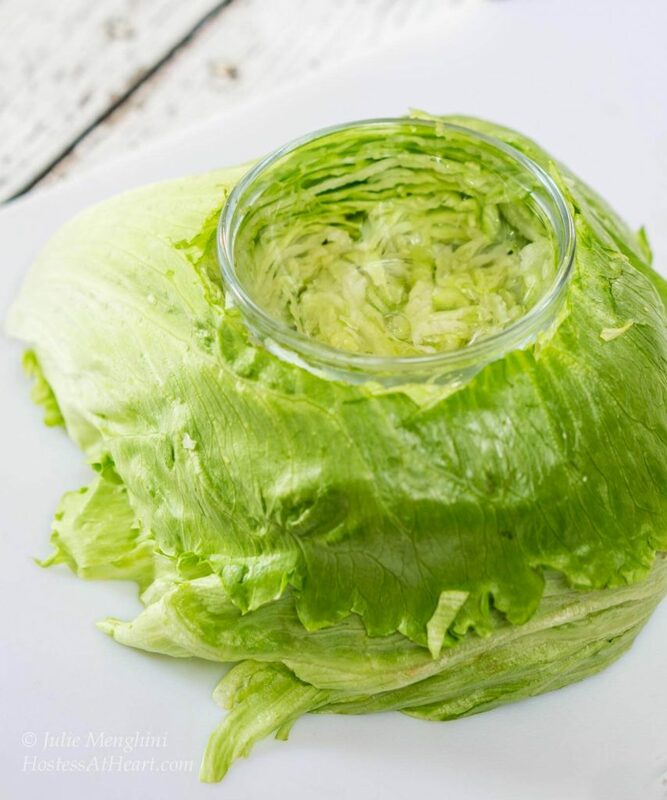 Place bowl into the center of the iceberg lettuce and fill with sauce. Refrigerate in a covered container or plastic wrap. Store sauce with plastic wrap pushed down against the surface of the sauce (airtight). This is the perfect appetizer to let guests help themselves. For another great appetizer, how about my Chocolate Vodka Infused Strawberries! t’s always fun to share so let’s head over to Fiesta Friday! Julie- these will be great to take to summer potlucks! Avocados and bacon are my favorite! Thanks for the recipe! My husband ate almost the whole thing himself! It was fun and easy to do. Thank you Michelle! I need this recipe!! I’m giving a summer party aka son’s going away to college party and this fits the bill, Julie! So fun! Thank you Angie! John tried to eat the whole thing himself over a couple days LOL! I so love your creativity Julie! It looks gorgeous! What n easy appetizer! Just perfect! Thanks for sharing. Genius way to enjoy the delicious flavors of a BLT! This looks perfect for summer BBQ season! Thank you Candice! I agree that it’s great for summer. What a clever idea…I especially like the sauce bowl in the middle of the lettuce. Thank you Karen! I was sure an easy clean up when the goodies were gone too. This is just great!!! Love the Avocado sauce made with yogurt,it’s a super variation from the Guacamole and the mini BLT skewers look too cute.. Thank you Shailaja! It was pretty and fun to do. What a great spin on BLT Julie, I love that there are no carbs going on in this colorful, festive and gorgeous looking salad. Trying to cut back on carbs and desserts, an ever-challenging struggle for me 🙂 The bacon had to have a great crunch to it, I’d pop a few of those in my mouth and be done with lunch. Very nice indeed, and that avocado sauce……yummmm! Thank you Loretta! They tasted just like our beloved sandwich without the bread. Can’t go too crisp on the bacon though or it will break off the skewer. I HAD to eat a few that didn’t make it. Enjoy your day! Oh gosh, this is so fun, Julie! Happy FF! Thanks Mollie! Happy FF to you too! This recipe looks great! I’ve made avocado sauce before, and my family loves it! Thank you Shari! It was fun to make, and John worked on finishing it off all by himself. The avocado sauce was really good and even lasted a couple days. I could definitely use that with other dishes too. Enjoy your weekend and I always love you stopping by and supporting me. I’m always up for anything with bacon, lol. This is such a great appy idea, Julie. Thank you Natalie! Bacon is always good in our house too! I saw this idea on Pinterest recently but not with a yummy avocado sauce. Anything with bacon gets my approval! Thanks Judi! Gosh Judi I should have looked on Pinterest! Maybe I’ve seen it and it was in the recesses of my mind? Love this, Julie, and that avacado sauce looks fabulous!! Thanks Anna! It is so easy and delicious! Are you kidding? Any bacon loving man of course! And then meeeeeeee! Thanks Ana!